Video monitors visualize carbon dioxide levels outside ICA. Art takes center stage, with technology playing an essential backstage role, at the Institute for Contemporary Art (ICA) at Virginia Commonwealth University, which opened recently at Belvidere and Broad streets in Richmond. A geothermal heat pump heats and cools the 41,000 square-foot building, reduces pollution and saves money. Traditional heat pumps take heat from outside air and warm the air inside. In summer, the process is reversed, and heat is removed from the inside and transferred outside. Traditional heat pumps become less efficient and eventually impractical as outside temperature drops. A geothermal heat pump takes heat from the ground, which maintains a relatively stable temperature year-round even a few feet below the surface. Geothermal wells are dug to capture the heat. The depth varies with the size of the building and other factors. Ground temperature varies with latitude but can range from 45 degrees in cold climates to 75 degrees in warmer regions, according to the U.S. Department of Energy. The year-round ground temperature in the Richmond area averages 55 degrees. During construction of the ICA, 43 geothermal wells were drilled 400 to 600 feet deep to capture heat from the ground, according to Michael Lease, Director of Facilities, Installation and Exhibit Design. Heat from the ground transfers to a water and antifreeze mixture in a closed loop system. The heated mixture is pumped through 6 miles of tubing embedded in the top 4 inches of concrete flooring to warm the floors in winter and cool them in summer. Lease explained that, in some more traditional heating systems, air is heated and blown into rooms. At the ICA, the warmed floors heat the air in much the same way that steam heat radiators provide heat. This gives more even temperature control. In summer, water from the geothermal wells cools the floors which, in turn, cool the air. While geothermal wells are more expensive to construct, the Department of Energy estimates that, on average, costs can be recovered in five years. Another energy-saving feature of the building is the use of 3,350 square feet of double glass walls on the east and west sides of the building. A 30-inch space between the glass walls provides insulation. Other vertical glass and skylights ranging from clear to opaque provide the best lighting for each area and filter out ultraviolet radiation that could damage artwork. The ICA exterior siding is made of zinc that has been given a pre-weathered patina coating. “The siding is nearly maintenance-free,” Lease said. No painting or washing is necessary. In fact, washing is not recommended because it could damage the coating. Over 8,000 square feet of roofs are planted with native vegetation to reduce stormwater runoff and insulate the building. The plants were selected to be low maintenance. They require no watering or weeding and are low-growth so they don’t need trimming. Lease explained that plantings for the building were selected based on the average Richmond climate. It was known that some plant species would survive while others would die off, but no one could predict which was which. That’s because the ICA is at the busiest intersection in Richmond. Pollution from vehicles and heat from pavement combine to create a microclimate. As a result, some of the plant species died off during the winter, while others filled in. “It’s like survival of the fittest” from Charles Darwin’s book, Origin of Species, Lease said. Some of the art installations that are part of the inaugural exhibition “Declaration,” deal with environmental issues. An installation titled “Fixed Air” by Jon-Phillip Sheridan, who lives in Richmond, links to a carbon dioxide monitor on the ICA roof to help display real-time current and accumulated levels of carbon dioxide produced by vehicles driving by. 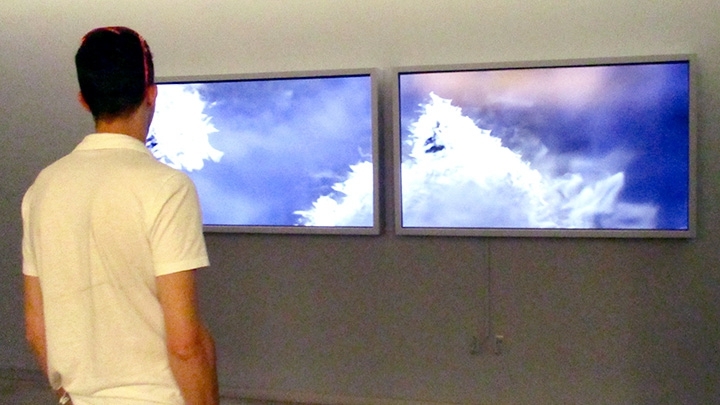 Software translates the data as varying cloud-like masses, which can be viewed on two video monitors. Graphs of the data are available online at fixedair.org. Another installation, “The Mending Project” by artist Lee Mingwei emphasizes recycling and reuse. Visitors can bring items of personal clothing that need repair and a volunteer mender will repair the item while engaging in conversation with its owner. Volunteers decorate worn or damaged areas with colorful patterns so the clothing can continue to be worn rather than discarded. The goal is not to restore the item to its original condition, but to share in the gift of conversation with a total stranger. Mended items remain on display, but owners will be able to pick up their items at the close of the exhibit. The ICA offers an interdisciplinary approach across the university and is open to the public free of charge. “We interact with everybody and operate like a separate college within the university,” Lease said. The “Declaration” exhibition will remain on view through September 9, 2018. Click here for more information on the work of artists Jon-Phillip Sheridan and Lee Mingwei.